About half of Americans (53%) say most people in our society these days look up to men who are manly or masculine, while 7% say society looks down on these men; 39% say society neither looks up to nor down on men who are manly or masculine. When asked how they think society generally sees women who are womanly or feminine, about a third of the public (32%) says society looks up to and 11% say society looks down on them; a majority (57%) says society neither looks up to nor down on women who are feminine. Views about how society sees feminine women are fairly consistent across demographic and partisan groups, but men and women – as well as Democrats and Republicans – have different perceptions of how society sees masculine men. Women are more likely than men to say society looks up to men who are manly or masculine: 62% of women say this is the case, compared with 43% of men. Democrats and Democratic-leaning independents (58%) are more likely than their Republican and Republican-leaning counterparts (47%) to say society looks up to men who are masculine. Views are even more polarized along party lines when those who say most people in our society look up to men who are manly or masculine are asked whether this is a good thing or a bad thing. A solid majority of Republicans who say society generally looks up to masculine men (78%) consider this to be a positive thing. In contrast, Democrats who say society looks up to these men are about evenly split: 49% say this is a good thing and 48% say it is a bad thing. Men and women who say society looks up to men who are manly or masculine also offer somewhat different assessments of whether this is a good thing or a bad thing. Two-thirds of men (68%) who say society looks up to masculine men see this as a positive thing; a much narrower majority of women (56%) say the same. 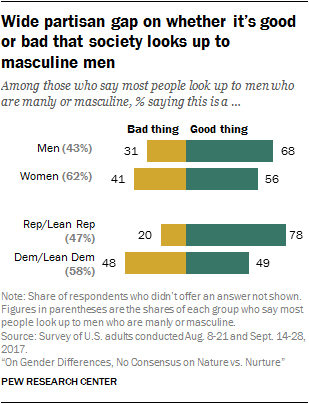 Overall, 60% of Americans who say society looks up to masculine men see this as a good thing, while 37% say it is a bad thing. And while relatively few say most people look up to feminine women, those who say this is the case overwhelmingly see it as a positive thing (83% say it is a good thing vs. 15% bad thing). While Americans tend to think society places more of a premium on masculinity than on femininity, women are more likely to say it’s important to them, personally, to be seen by others as womanly or feminine than men are to say it’s important that others see them as manly or masculine. About half of women (52%) say it’s at least somewhat important for them to be seen as feminine, including 20% who say this is very important to them. 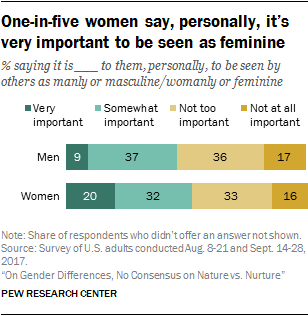 Among men, slightly less than half (46%) say it’s important to them, personally, that others see them as masculine, with just 9% saying this is very important. Perhaps not surprising, men who say society looks up to masculine men are more likely than other men to also say it’s important for them to be seen by others as manly or masculine; and the same is true of women who say society generally looks up to feminine women (they are more likely to say it’s important to them, personally, to be seen as womanly or feminine). 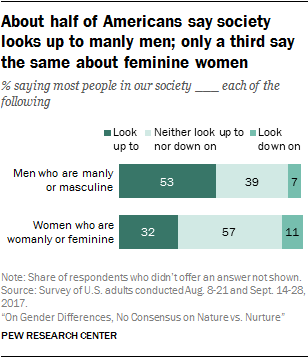 Still, while about seven-in-ten women who say society looks up to feminine women (69%) say it’s important that others see them as such, a smaller share of men who say society looks up to masculine men (55%) want others to see them as manly or masculine. Across generations, Millennial and Gen X men and women are about equally likely to say it’s important for them to be seen as masculine or feminine, respectively: About half of men and women in each of these generations say this. Among older generations, however, the shares of women saying it’s important that others see them as feminine is far higher than the share of men saying it’s important that others see them as masculine (55% of Boomer women vs. 40% of Boomer men and 59% of Silent women vs. 36% of Silent men). Men and women offer nearly identical answers when asked how they would describe themselves in terms of their masculinity or femininity. About three-in-ten men (31%) say they are very manly or masculine, 54% describe themselves as somewhat masculine and 15% say they are not too or not at all masculine. Similarly, 32% of women say they are very womanly or feminine, while 54% say they are somewhat feminine and 14% say they are not too or not at all feminine. Black men and women are more likely than their white counterparts to describe themselves as very masculine or feminine. About half of black men (49%) see themselves as very masculine, compared with 28% of white men. Similarly, 47% of black women say they are very feminine, while 27% of white women describe themselves this way. About four-in-ten Hispanic women (42%) and 34% of Hispanic men say they are very feminine or masculine, respectively. Educational attainment is also linked to how men and women see themselves. Roughly four-in-ten men with a high school diploma or less education (37%) and 31% of those with some college say they are very manly or masculine, compared with 22% of men with a bachelor’s degree or more education. The shares of women in each educational group who say they are very womanly or feminine are nearly identical to those who say they are very masculine among their male counterparts: 38% of women with no college experience, 30% of those with some college and 24% of those with at least a bachelor’s degree describe themselves this way. In other ways, the patterns are quite different between men and women. For example, while there is no clear link between a man’s age and how he sees his masculinity, Millennial women are considerably less likely than women in older generations to describe themselves as very womanly or feminine. About one-in-five Millennial women (19%) say they are very feminine, compared with about a third of Gen X (32%) and Boomer (36%) women and an even larger share of women in the Silent Generation (53%). Among men, Republicans are more likely than Democrats to describe themselves as very manly or masculine: About four-in-ten Republican and Republican-leaning men (39%) do so, compared with about a quarter of Democratic and Democratic-leaning men (23%). Among Democrats, nearly identical shares describe themselves as not too or not at all masculine (21%) as say they are very masculine (23%). Just 8% of Republican men say they aren’t particularly masculine. Partisan differences don’t stand out in the same way when it comes to how women see themselves. In addition to asking how men and women see themselves in terms of their masculinity or femininity, the survey asked men and women how well certain words or phrases describe them. For the most part, responses didn’t vary considerably by gender. For example, similar shares of men (24%) and women (26%) say they are very assertive. And while women are somewhat more likely than men to say they are very intelligent (46% vs. 41%, respectively) or physically attractive (17% vs. 11%), these gaps are relatively narrow. In contrast, there is a wide gap in the shares of men and women who describe themselves as very nurturing and very sensitive. Women are more than twice as likely as men to say they are very nurturing: 51% of women describe themselves this way, compared with 20% of men. And while 46% of women say they are very sensitive, about a quarter of men (24%) say the same. Women who describe themselves as very feminine are particularly likely to say they are very nurturing (65% vs. 48% of those who say they are somewhat feminine and 35% of those who say they are not too or not at all feminine) and very sensitive (55% vs. 44% and 33%, respectively). Among men, three-in-ten or fewer among those who say they are very, somewhat or not particularly masculine describe themselves as very nurturing or sensitive. When it comes to physical strength, men are only slightly more likely than women to say they are very strong (20% vs. 13%). But when those who say they are at least somewhat physically strong are considered, the gap widens considerably: 78% of men say they are at least somewhat strong, compared with 60% of women. About four-in-ten women (39%) – vs. 22% of men – say they are not too or not at all strong. Among men who describe themselves as very masculine, 40% say they are very strong, compared with 12% of men who say they are somewhat masculine and 7% of those who say they are not too or not at all masculine. Women who say they are very feminine are also more likely than those saying they are less feminine to say they are very strong (21% vs. 9% of those who say they are somewhat feminine and 11% not too or not at all feminine). Black men and women are more likely than their white counterparts to say they are very strong and very attractive. About a third of black men (35%) say the phrase “physically strong” describes them very well, compared with 18% of white men. And while 22% of black women say they are very strong, 10% of white women say the same. Among Hispanics, 22% of men and 16% of women describe themselves as very strong. When it comes to looks, 30% of black men consider themselves very attractive, compared with about one-in-ten white (8%) and Hispanic (10%) men. And while about a third of black women (34%) and a quarter of Hispanic women say they are very attractive, just 12% of white women describe themselves this way. Black men are also about twice as likely as white men to say they are very nurturing: 36% of black men describe themselves this way, vs. 17% of white men. No such difference is evident between black women and white women. Black women are far more likely than white women to say they are very intelligent, however (62% vs. 43%), while the difference in the shares of black men and white men who describe themselves this way is not significant.